Try Scuba is your chance to get wet and experience what scuba diving is all about. We know that once you come in and try it, you’ll love it! This is a pool experience only where you get to spend roughly an hour at the pool getting a taste for this great sport. We gear you up, show you how, and get you in the water. All that you need to have with you to get started is a swimsuit, a towel, and a great attitude. We provide all the life support and snorkeling equipment needed to get you started. Be ready to have tons of fun when you show up! Our pool is small and space is limited, so you do have to schedule in advance what day you want to come in. 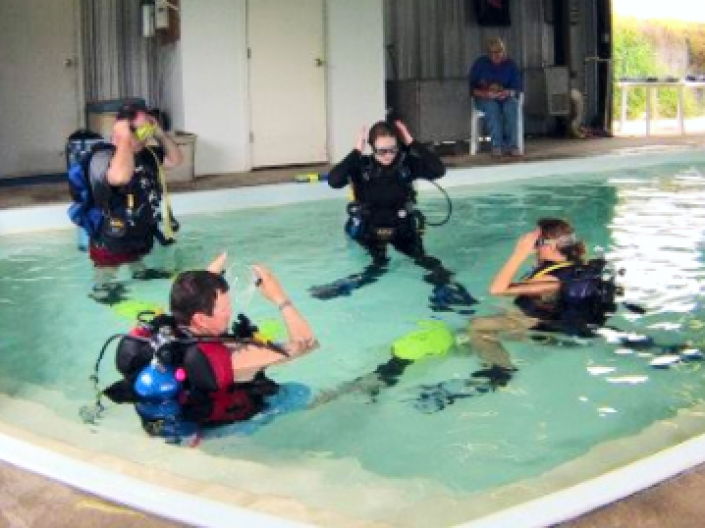 Once we have your Try Scuba Form filled out and the payment taken care of, we can get you scheduled. If your schedule doesn't match ours, ask about our Executive Try Scuba option. We can put together a one-on-one class, just for you! It is only $50! Plus, you can apply that $50 to the cost of a full class, when you decide to enroll in one of our Open Water Diver Courses.